Released on July 14, 2017, Hour of Devastation is a small set that may need time to fully entrench itself into Magic: the Gathering‘s various metas, from Standard to Commander. 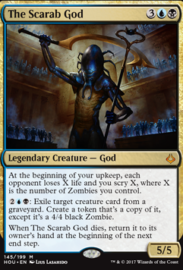 The Scarab God is a standout mythic rare in HOU, especially due to its potential as a Commander and its powerful abilities. A small set at 199 cards, Hour of Devastation carries over Amonkhet‘s strategies in Limited, such as -1/-1 counters, exert and brick counters. 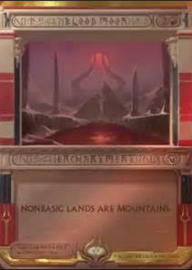 Hour of Devastation‘s effect on draft was to noticeably slow down the format, often by diluting the fast and powerful red-white aggro strategy from triple Amonkhet draft. In addition, the set’s continuation of the cycling mechanic added draw power and graveyarad synergy to draft and sealed deck. By contrast, in Constructed, Hour of Devastation has found limited entry points so far. 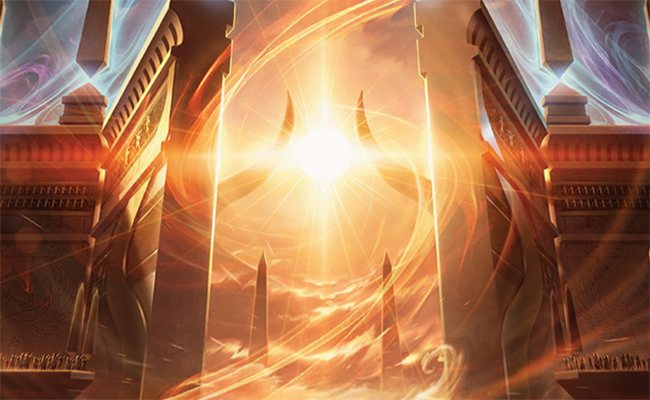 In Standard, new sets often need time to work themselves into the format, and Hour of Devastation has followed that trend. Few cards are included in dominant strategies such as green-black Constrictor or various Vehicles builds or zombie tribal, often because those strategies are based on synergies and tribal support found in older Standard sets such as Kaladesh and Battle for Zendikar. No Hour of Devastation cards produce or us energy counters, for example, neither do they synergize with Vehicles, aside from creatures having high power to crew them. Cat tribal, however, benefits from the set, such as the inclusion of Pride Sovereign, a large Cat that can exert itself to create even more Cat tokens. Also, mono-red aggro, or Ramunap Red, has taken off, especially based on Hour of Devastation‘s desert theme and effective red creatures. Earthshaker Khenra has already proven itself a cornerstone of this deck, a cheap creature with haste that can shut down blockers based on its power. The Eternalize mechanic allows it to return as a massive 4/4, and this high power allows the Khenra to shut down even more blockers. The deck’s namesake card, Ramunap Ruins, allows players to repeatedly deal 2 damage to creatures or players by sacrificing Desert lands (which are plentiful in the deck), giving the deck much-needed reach and steam as games go on. Many of HOU’s invocations are low-value Masterpiece Series cards, but the set has a few standouts, such as Blood Moon, a powerhouse in Modern. A similar picture is drawn in Modern and Commander. Many of Hour of Devastation‘s cards are highly focused on Limited and Standard (especially after rotation later this year), though a tiny handful of cards may see play. Ramunap Excavator, for example, has the same ability as the famed Crucible of Worlds, and has a 2/3 body on top of that. Liliana’s Defeat can be powerful in Modern due to destroying creatures such as Death’s Shadow, as well as destroying the notorious Liliana of the Veil. Also, the split card Claim//Fame adds power to Death’s Shadow aggro decks, since the Claim half can revive Death’s Shadow. This card can be useful in other Modern shells such as Grixis Control variants, where it can revive Snapcaster Mage or Delver of Secrets. Hour of Devastation provides a risky but powerful new sweeper with Bontu’s Last Reckoning, which trades lands untapping for an undercosted boardwipe in a color that often needs such power. In Commander, most of Hour of Devastation‘s cards have no use, but the three Gods have the potential to be effective Commanders, or simply provide more power in the main deck. Although they are not indestructible like earlier cycles of Gods, these three two-color Gods have far-reaching activated and triggered abilities that can synergize well with many different builds in their colors. And like in Modern, Ramunap Excavator can provide strong land-based synergy. Hour of Devastation suffers financially. Its estimated value, or EV, for a booster box is the worst in some time. According to mtggoldfish.com, the average EV of an Hour of Devastation booster box is $82.20, well below most prices for a booster box. The set compares poorly to earlier sets such as Kaladesh and Shadows over Innistrad, even counting the value of potentially opening an Invocation card in the box. As of release, mtggoldfish.com estimated an average value of the sert’s mythic rares at $4.52, which barely recuperates the cost of an average booster pack. The rares average to $0.72, further undermining the chances of making all your money back on a box. The set has few flashy rares or mythic rares, as reflected in the EV, although in time, some rares may find a place in various formats and climb in value. As a whole, Hour of Devastation may need much more time to prove itself to players in all formats. Upon Standard rotation when Ixalan starts, Hour of Devastation may find new life in Standard once the decklists change and synergistic decks like green-black Constrictor vanish. Until then, Hour of Devastation is merely a small bonus of a set compared to other recent products.